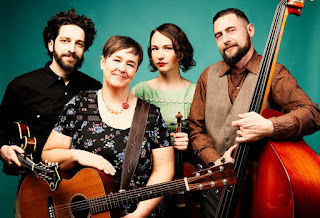 Annie Lou is the project of Anne Louise Genest, an artist who walks with the spirit of an old storyteller, creating songs steeped in the flavours of old-time mountain, Appalachian, traditional country, and bluegrass music. She has spent years chronicling the rural life-paths of Canada, writing songs that tell the tales of the hard-won victories of everyday men and women. Annie Lou has toured major festivals and venues across the country and has been nominated for a Juno and several Canadian Folk Music and Western Canadian Music awards. 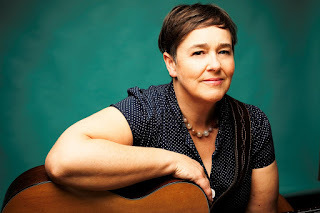 Horizon Stage is pleased to present Annie Lou on Friday, March 23 at 7:30 p.m.
With humour, grace, and warmth, Annie Lou takes the stage with banjo and guitar, and invites you in to her colourful world of original music rooted in melodic traditions and delivered with an inspired energy and spark. She paints vibrant musical landscapes where you can laugh, cry, dance, reflect and connect with ballads, tunes, and songs inspired by lives and times and ups and downs. Her beautifully creative songs range from rousing and boisterous to gentle and poignant. They map a homescape of hard-drinking grandmas, rural dancehalls, blue collar fashions, small towns, and big cities. All are delivered with Genest’s vocal warmth; evocative of the sweet tones of Kate and Anna McGarrigle blended with the raw emotion of Hazel Dickens. Annie Lou is releasing her fourth album, End Zone, a gorgeous collection of new songs that draw deep from the well, filling the bucket with rich melody and wry wisdom. No, it’s not about football. Most of the material for the album was written during the last months of her mother's life, and the title track is an exploration of that time when the end is near, but not quite. The album features a guest cast of Canadian acoustic innovators, including Andrew Collins on mandolin and guitar, Max Heineman on upright bass and vocals, Sarah Hamilton on fiddle and vocals, John Showman and Trent Freeman on fiddle, Frank Evans on banjo, Burke Carroll on pedal steel, and Ivan Rosenberg on dobro. Real, raw, and deeply honest, End Zone is a magical addition to the Annie Lou catalogue. Annie Lou is headed out on a Western Canada CD Release tour this month, with Collins, Hamilton, and Heineman in tow. Together they are a tight vocal and instrumental unit that offers superb musicianship and an infectious delight in their craft. In live performance the band gallops along with joyful danceable precision, enticing audiences with twin fiddles, banjo, three and four part harmonies, call and response, and compelling instrumental solos. Touring B.C., Saskatchewan, and Alberta, Annie Lou’s only concert in the Edmonton area will be at Horizon Stage in Spruce Grove on Friday, March 23 at 7:30 p.m. Tickets are $35 for Adults and $30 for Students and Seniors and may be purchased at the City Hall Ticket Centre (315 Jespersen Ave), by phone at 780-962-8995 or 1-888-655-9090, and online through Ticketpro.ca. (they) move across a range of emotions and each evokes the right texture."